NEW YORK (CBS/WTSP) Olivia Namath, the daughter of New York Jets legend Joe Namath, was arrested for a pile of marijuana and an open bottle of rum found in her car during a Florida traffic stop, according to The Palm Beach Post. A Palm Beach County Sheriff's deputy first spotted Olivia Namath, 19, in a silver Mercedes speeding on Sunday around midnight, according to a police report obtained by the Florida paper. 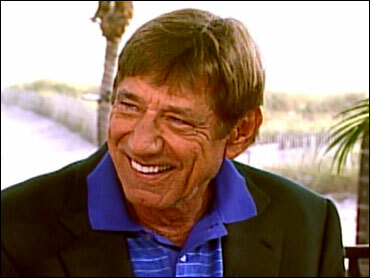 Photo: Former New York Jets quarterback Joe Namath. When the deputy approached the car and checked Olivia Namath's driver license, he smelled what proved to be marijuana, according to the police report. Police searched her car and found a bag of "leafy greens" on the driver's side floor board, which later tested positive for marijuana, according to the report obtained by The Palm Beach Post. They then searched the trunk and found 200.5 grams of pot distributed in baggies. That's about half a pound. The 19-year-old Namath "denied any knowledge" of the marijuana, according to the deputy's report obtained by the Florida paper. 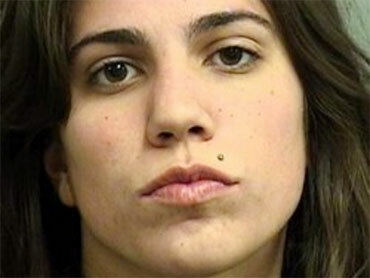 She was travelling with two men when she was pulled over. The Palm Beach Post reports she is charged with two counts of marijuana possession, including one with intent to sell and with possession of alcohol by a minor.